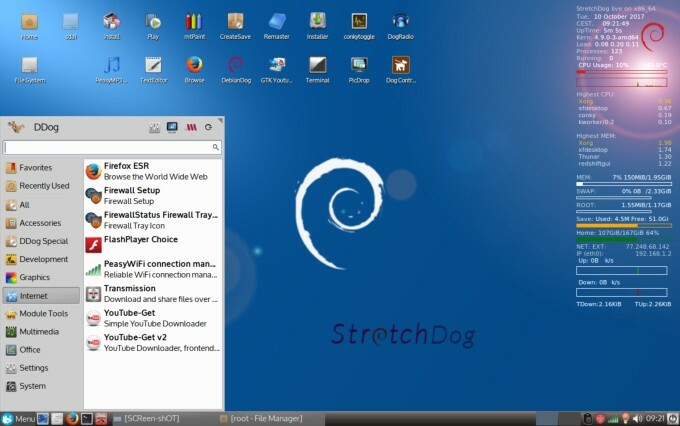 StretchDog is a variant of DebianDog (Info and credits) based on Debian 9 "Stretch"
Default WM - OpenBox with on top xfce4-panel and xfdesktop. Default File Manager - Thunar with option to use rox. Seamonkey package name is "seamonkey-mozilla-build"
Thanks very much to everyone who has been involved with DebianDog, specially Toni (saintless), William (mcewanw), Terry (sunburnt), dancytron, belham2, rcrsn51, wiak, jd7654, backi, AndresC2, peebee and all who helped by giving feedback on the DebianDog threads. For those having trouble booting with kernel 4.9, here's alternative (32 bit only), not ofiicial Debian though. Extract This archive: kernel-4.4.87-i386.squashfs.tar.gz in the frugal installed 'live' directory. Taken from OscarTalks's D-pup-Stretch (thanks!). Now there are total 3 (three) Dog Stretch threads on this forum and countless other Debian/UbuntuDog offsprings out there. This latest Dog endeavor could have easily been consolidated into an existing thread! You make the whole crowd happy/smile once again . Don570, I've been installing UExtract (just the one and only latest .pet SFR releases every so often) into both 32-bit and 64-bit for a few years. I don't get it, I've never had a problem in any 32 and/or 64 bit OS, pup, ddog, or otherwise using the one & only .pet SFR releases (and updates). What would your .pet do that I am not already getting? Jeez, I am really, really confused now because SFR explained to me long ago that it didn't matter for his UExtract pet (they install both to 32 ans 64 bit equally) since UExtract is a script. and expected the packages available to be listed in 64 bit section. I liked how it played back media files. No strange artifacts and very smooth. The audio was low when first installed, but easy enough to increase. It wouldn't run. The error mentioned that the icons were missing. This is a common error and has been written about. pfind doesn't work very well , so I looked into why it wasn't searching the right drives. Thunar could be used as well but I like rox. Yes, forgot to add to 64-bit repo. Indeed, as it's just a script it could be: uextract_3.30_all.deb, to be suitable for both/all architectures, but kept it like it is now to avoid too many changes. Thanks for your recommendations for pfind. Let's start with the control file. 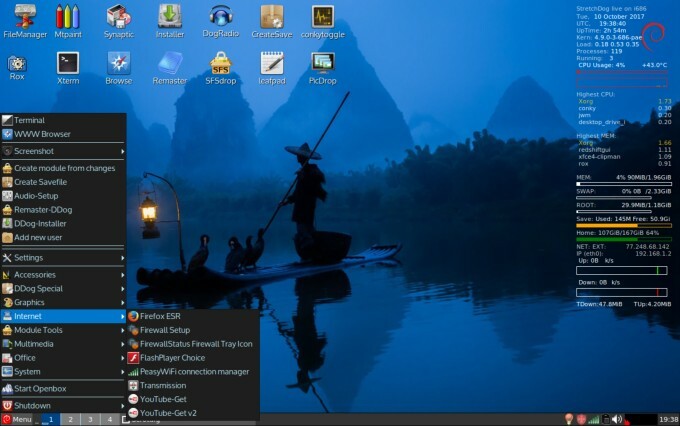 The version number must have a dash with an additional Debian package version number, e.g. '1.1-1'. If your program consists e.g. only of portable shell scripts, use 'all' as its 'Architecture'. Also I found out that official pet packages need to be carefully named. what should be my parameter when doing frugal install to this stretchdog? tried this but not working.